I remember three things vividly from high school chemistry in Bozeman, Mont. : a terrible walk in December 1972 from home to school for a 6:30 a.m. lab with the temperature at 20 below zero; organic chemicals smelling as bad as promised; and the teacher, a veteran with a crew cut, promising the world we students would know when we were his age would be a completely different one because of the exhaust coming out of the tailpipes of our cars. 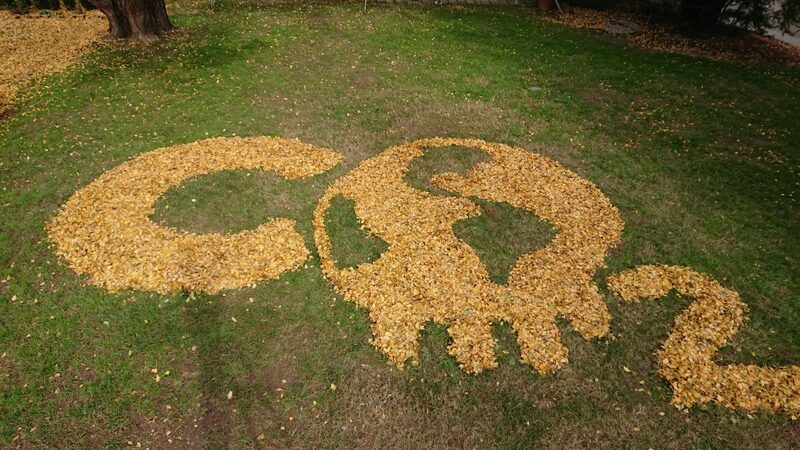 When Senior Horticulturist Elizabeth Fogel asked if she might use the chemical symbol for carbon dioxide for her ephemeral art of Gingko leaves, I remembered the class and my skepticism of his gloomy prediction. Although generally optimistic, I remain skeptical by nature, though I like to say that I am a sucker for a good argument. The U.S. federal government released just such a good argument this last Friday. The Fourth National Climate Assessment (NCA4) is a product of the United States Global Change Research Program (USGCRP), which is charged by the Global Change Research Act of 1990 to deliver a quadrennial report to the President and Congress. The report details the natural and artificial factors that influence climate change, and that it seems highly probable that “Greenhouse gas emissions from human activities are the only factors that can account for the observed warming over the last century.” To this statement, others as skeptical as me by nature might counter that this is not certain, and while highly probable, no, it is not 100 percent certain. What is 100 percent certain — human activity (yours, mine, ours) is the only thing we can control if the impacts of climate change are to be mitigated. Lewis Ginter Botanical Garden wants to have the conversation, difficult and challenging, in turn, discouraging and hopeful. We see the negative impacts on the landscapes botanical gardens maintain and the communities we serve. We want to lessen those impacts, and we want to have the conversation with all our neighbors, individual, governmental, and corporate, on how we might best do that. Meanwhile, if you want to start thinking about what we might do (you and I), the executive summary has some suggestions worth considering. Each year Horticulturist Elizabeth Fogel creates ephemeral art out of the fallen Ginkgo leaves. This year’s image is a combination of the symbol for carbon dioxide (CO2) and the earth melting, drawing awareness to the issues of global warming and climate change. Executive Director Shane Tippett's passion for plants was kindled in the early ‘90s by a Lewis Ginter Botanical Garden arborist who mentored him on the care of specimen trees. This passion underlies his firm conviction in the transformative power of gardens to re-shape and renew communities, families and individuals and this continues to direct his leadership. Connecting people through plants to improve communities.